We are truly grateful what we experienced at Ever-Growing Family Farm. 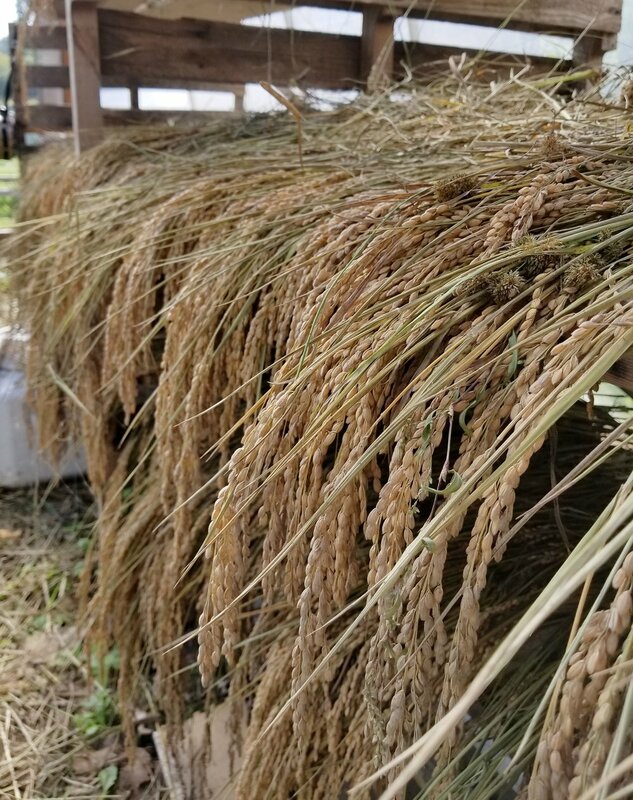 The farm cultivates many different type of rice, Japanese (Akitakomachi and Koshihikari ), Russian (Duborskian), Italian (Nano) and African rice. What a humble to learn with rice farmer Badjie and his three sons, and also they taught us wonderful hospitality. We appreciate a bowl of cooked rice more and more. This is a traditional rice grown by native Mayan people who called it "Blue Bonnet." Collected by Mennonite farmers who have a community near Belmopan, it was given to them by their Mayan neighbors in the town of Armenia, Belize. It is an upland rice variety and does not need to be flooded. It can be grown in regular garden soil. The rice should be planted in a bed after last frost in rich soil, 5 to 6 inches apart both ways. If planted in rows, the rice should be 2 to 3 inches apart with 1 to 2 feet between plants. It is important to keep the weeds down and keep the soil moist. This is a premium Japanese short grain rice that is distinguished by its aroma, sweet flavor and texture. It is an early maturing semi-dwarf variety that has been grown successfully in the United States since 1991. Dried stalks are beautiful displayed in flower arrangements. Leaves and hulls are rough. It is a warm season annual that can be planted in late spring to early summer and grown in a flooded paddy. Maturity: Approx. 160 days. Polyculture is a type of agriculture that uses multiple crops in the same space, providing crop diversity in imitation of the diversity of natural ecosystems; avoiding large stands of single crops, or monoculture. Many rice growers in Asia grew rice in the early spring when the fields along the valley bottom were still flooded from the spring rain. The water helped control the weeds. Over the years they learned to create a complex polyculture with soybeans growing around the fields, fish in the fields as a sort of aquaculture and duck and geese eating weeds and insects before the fields were flooded. This ecological science design of polyculture gives us an opportunity to use these diverse techniques and incorporate them into a new adaptable way for us to inhabit the healthy Earth. We returned to the rice paddy after 20 days of sowing. We had left a mirror of water but the paddy field is empty. Has something been added or did someone brake a bank? No, everything is ok! It is a normal rice cultivation practices. In fact, the water is not always present in paddy field. Along the rice grow, water could be added to raise or be reduced to lower. The most visible drying of rice field calls “Prima Sutta” in Italian local language which is crucial for rice. Now, I could describe why. After 10-15 days, true leaves have emerged on rice seedling and thin white roots have stretched. Rice seedling roots start to anchor to the soil, they are not necessary to reach out to blew the surface of soil on this stage. Water is the main key here because rice seedling roots are looking for water and try to anchor down. This stage is very important because if rice seedlings doesn’t want to ground, they could be floated away by waves and wind. This is same fundamental when you built house, you need to have a solid foundation. Rice seedlings have to have sturdy feet to grow as a strong plant. When you hold rice seedling with white roots and small green leave will envision the full grains of rice paddies. This time of rice paddies is brown field with little green dots which the life starts germinating. During the past few weeks, Venice has been sowing one of its main crops, rice. But now the planting has slowed, and the land has been flooded with water. The image above is a “reticulated sea”, as the rows of rice can be seen below the water. The North of Italy, in the region called Veneto, rice cultivation was introduced in early 16th century by the Venetians. 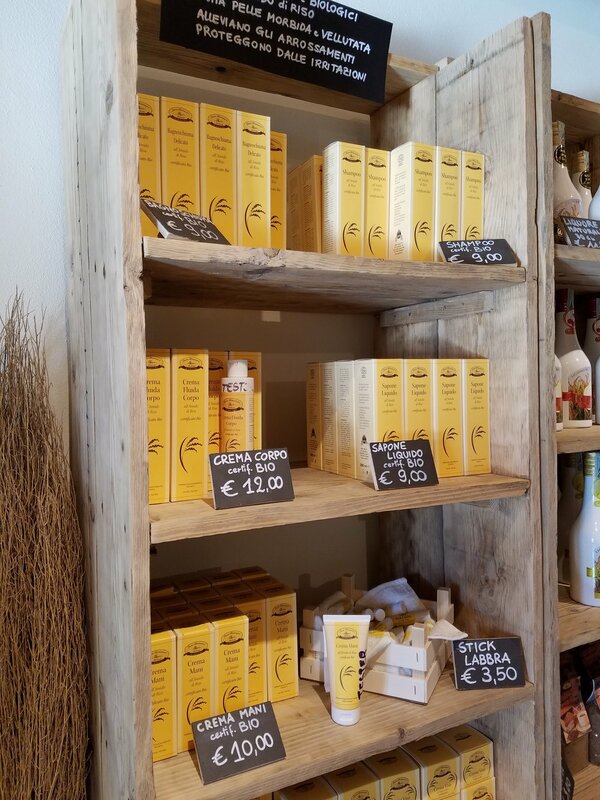 Because the rice crop has been sown for over 500 years, rituals and traditions of the rice culture here have a strong connection with the local Venetians. They were people dedicated to maritime commerce, but rice was also a major staple. The northern mainlands under the control of the Venetians have crops thanks to the ancient and extensively organized irrigation system, which is still on record in the archives of Venice. Today the seeding happens by tractor, guided by satellite GPS. Under the funnel, the brown seeds are spread by a rotor that spins them around. This process takes place on a dry paddy field and when it is finished the rice field is immediately flooded to prevent flocks of birds from eating the freshly planted seeds. To prevent the rice from floating, the rice is pre-soaked in large tanks the day before planting occurs. Modern tractors are still modeled on the ancient technique, when the rice was spread by the masterly hand of the “Risar” seed planter. The Risar was a man of knowledge and experience because the best crop was dependent on his good work. On his left arm he kept rice seeds, and with his right hand he spread seeds every one or two steps with an arched motion. In past they usually sowed in the flooded paddy. The water let them control how well the paddy was smoothed. To see where the arch of seed had landed, two men called “spie” (literally “spies”) accompanied the Risar with long sticks so he could see where the last seeds had been spread. In this way, as they do now with GPS, it was ensured that the seeds were not wasted, and parts of the field were not left uncultivated. The first day of sowing, the 25th of April, is dedicated to St. Mark the Evangelist, the Patron Saint of Venice. This day ensures good luck for the harvest. The Regent, or chief magistrate of the city of Venice, is also given a traditional Venetian dish; risotto I piselli or rice with peas. The dish is made with the rice of the lowlands and the peas of the hills. Of course, it is probably also combined with a good glass of wine. Earth Day screening of Seeds of Time at New York Botanical Garden. Seeds of Time follows agriculture pioneer Cary Fowler's global journey to preserving biodiversity in agricultural crops along with climate change. We were fortunate to hear Cary Fowler & Sandy Mcleod’s discussion after the film screening. They talked about one of challenges being that heirloom seed varieties & botanical domestic seeds varieties importance to be saved to in order to preserve for future crops and food for future generation. They also hope for a strong support for science research program to be continued. Flooding rice fields in cold season creates suitable winter wetland habitat for resident and migratory a wide range of wildlife. Ginseng root (Panax quinquefolius) is any one of the 11 species of slow-growing perennial plants with fleshy roots growing in a woodland, cool climate. Wild ginseng roots sell for up to $500 or $600 per pound in the market. Older ginseng is the most valuable, and one of the most valuable plants in the world. Commercial cultivation of ginseng has expanded in Korea and China due to huge demand. Ginseng agriculture is a sustainable practice which uses rice straw. The ginseng is directly seeded and covered with rice straw to protect the seedlings and small roots during the cold winter. The rice straw also acts as a screen from direct sunlight. 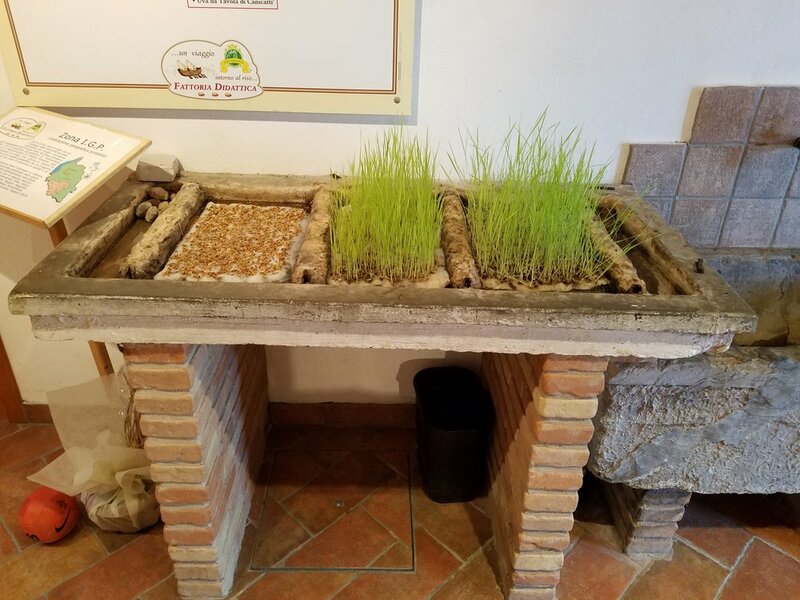 As the rice straw decomposes and becomes compost, it helps the roots get healthy and strong. Farmer installing rice straw as a screen. Rice husk coal or carbonized rice husk, (Khuntan燻炭 / Ibushisumi) is a excellent soil improvement material. It improves drainage, allows the soil to breathe, and is the habitat of microorganisms that also improve the soil. Rice husk coal has an alkaline pH of 8-9, that when added to acidic soil, helps to enhance the disease resistance of vegetables. The lightweight coal can easily be added to potting mixes or used alone as a cover crop to prevent weeds. *tomononekko.blog - DIY Khuntan. Guide to making Rice husk coal. Rice straw is the dried leaves and stems of the rice plant that remains after the rice grain is removed. After rice crops have been harvested in the fall, this rice straw is used as a mulch in the agricultural field. Rice straw is lightweight, biodegradable, neutral in pH and rarely contains weed seeds. It can also be used as a base layer for another mulch. Rice straw mulching has a significant effect on conserving initial soil moisture and reducing weed growth. In the spring the rice straw is tilled into the soil to add nutrients for the new crop of rice plants. It is also used in vegetable gardens, and as a winter covering. Why are rice straw bundles stacked upside down and hung on racks in the fall rice field? Because they need to dry in the sun. The grain is traditionally dried in the sun in order to reduce the moisture content for long term storage. When the grains are spread out in the field, the amount of moisture that evaporates is maximized.There are a few different economical methods of sun drying. Field drying, which is pre- drying a hand harvested crop before threshing, and panicle drying, which is a smaller scale method for farmers. Large scale farms require rice dried on pavement and out of the fields. Farmers can also dry the grains mechanically but it is more expensive and less environmentally friendly. This traditional way of drying can have some disadvantages such as rain or night time humidity. Excessive respiration can lead to delays in drying or fungal growth, which could cause yellowing and grain loss. The name ''new crop,'' refers to short grain rice that is milled and cooked within two months of its harvest. The taste of new crop short grain rice is cleaner and has a sweeter flavor. It also tends to be stickier because the rice grains have retained some moisture. The taste and texture of new crop rice is ideal when served alone. Old crop rice tends to be less sticky because it contains less moisture. It is ideal for dishes like fried rice or curry rice. Interestingly, most sushi restaurants in Japan use old crop rice because as it loses moisture it develops small hairline surface cracks which permit vinegar to be absorbed better. 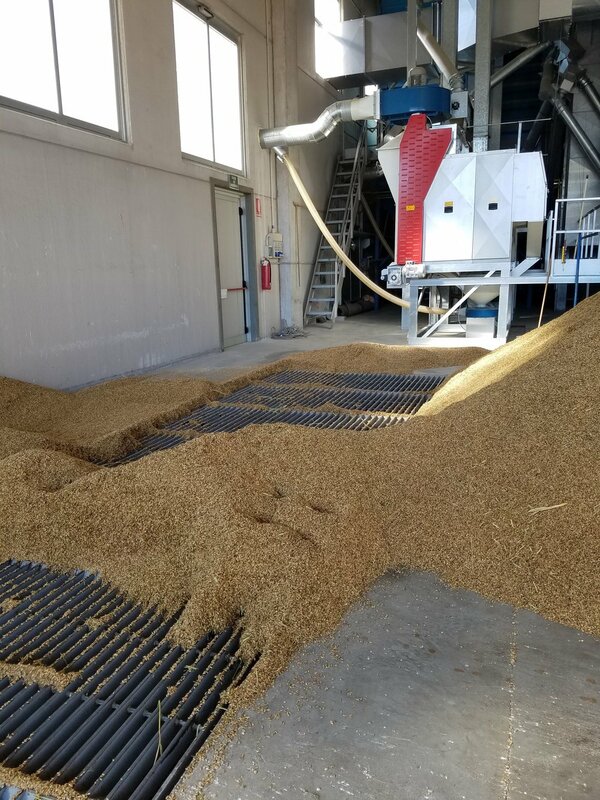 Most rice in the United States is harvested and run over a high-heat drying table, a process that converts the kernels to mature, aged rice without any remaining new crop quality. In contrast to short grain rice, premium long-grain Basmati rice is aged 12 to 18 months to intensify its aromatic properties. This rice complements the heat, spice and complexity of Indian food. Korean Winnowing Basket: KEY (in Korean = winnowing basket) is a thin, flat wicker and bamboo woven basket. It gathers, separates and pours the grain. A winnowing basket has been an important tool used in Korea for centuries. The flat and wide shape of the narrow backed basket is specifically designed to separate the grain from its husk. When using an upward sweeping motion of the KEY, a wind tunnel is created, which causes the heavier grain to sit in the back of the basket, while the lighter debris, or husks escape into wind. This effect is called ‘winnowing’. In addition to separating grain, the KEY has an important ceremonial purpose. The elders in Korea believe that during periods of severe drought, the KEY can bring rain. The ceremony requires one of female villagers to go down to the stream, scooping and draining water from the KEY over and over, simulating rain falling from the sky in order to bring rain for their crops.